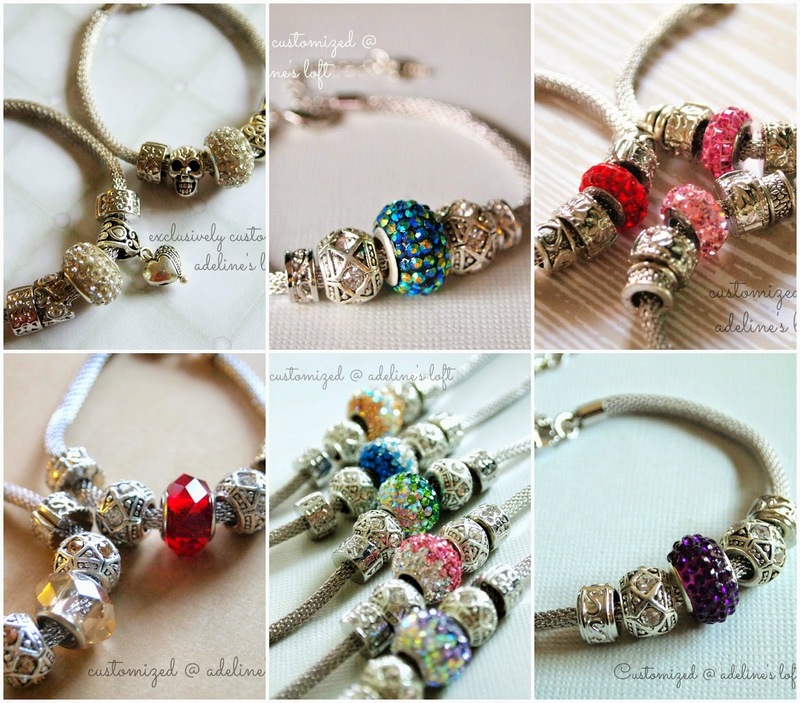 The Popularity of European Charm Bracelets + Giveaway! The European charm bracelets style seems to be an ever growing popular jewelry to wear on your wrists, even though it has been around for a long time. Famous brands, like the very familiar Pandora or Soufeel - are very high end pieces that many have fallen in love with and also probably one of the most precious gift that can ever be presented to a woman. For anyone that is unfamiliar with this bracelet concept, it is basically a thick snake-chain like bracelet with a range of specialized beads to choose from, which you can slide or clip onto. The beads can either be left to slide freely on the bracelet or locked together with special designed stopper beads. In other words, it is a very customizable and versatile piece of bracelet to wear. At Adeline's Loft, it has always been my personal intention to keep handmade jewelry affordable. I don't know if you would agree, but sometimes, it is truly not the monetary value of a jewelry that matters, but the significance that it is customized from the heart to be gifted to a loved one or for yourself. I discovered putting together European charm bracelets and introduced it to my shop a few months ago. Since then, there has been a favourable response and continued request for this styled bracelet. So much so, I have dubbed them as the new "friendship bands". Some of the bracelets that were customized. There is currently only a small range of beads that I can offer to my customers. However, I will be looking into importing more gorgeous beads to cater to the year end festive period. So do remember to 'like' my Facebook page and be updated with new (but limited beads) within the next 2 months. The materials contained in this European charm bracelets would generally consist of a mix of white gold plating (bracelet), Tibetan silver (similar to pewter) and silver plating (generally with nickel base). The price of a bracelet ranges from S$32 onwards, depending on the final selection of beads. How does ordering this bracelet at my shop go about? Usually, a main focal is chosen by my customers, that is the colored crystal ball, followed by my recommendation of accompanying beads. I would like to bless a reader with this specially selected, stunning blue tone theme charm bracelet! The highlight of this piece is probably the very dainty light blue swarovski crystal butterfly on a very vintage looking bail. The standard bracelet length for the bracelet is 17cm with an extra inch of extension chain. This bracelet would be worth S$48 in my shop. To enter yourself for a chance to win this bracelet, please fill the necessary details in the Rafflecopter widget below.The more steps you undertake, the more chances you have to win! * This giveaway is open only to female readers residing in Singapore. * No further request on the bracelet design will be entertained. * The winner will be contacted via email after the draw has been made. If there is no response within 24 hours, I will draw another winner. * This giveaway ends on 1 Sept 2014. Your handmade jewellery is elegant, stylish and handmade with love. This piece of vintage blue charm bracelet would make any lady's day when she wears it! :) I'm hope I'll be the lucky one. Thanks for running this giveaway. This bracelet is so pretty! I've entered and done the steps for the giveaway! Hope to win! I really kept the last order for myself! Didn't give it away coz I loved it too much... winning this would be great! my girl friends LOOOOVVVVVEEEE the green and purple friendship bracelet i ordered..i won to win this for my self! I love blue and this bracelet is lovely. Thanks for the giveaway. Love the Blue, my family Favourite colour. Love the colour combi! Usually not a jewelry person but really can't resist this! Hope to win! This bracelet is so pretty! Hope I am the lucky person to bring you HOME. I love Blue ! Lovely piece ! Would love to win this as my birthday pressie ok hahaha ! Thanks for the chance to win! Would love to have this piece to update my wardrobe. Haven't done a wardrobe update or revival since I became a SAHM 4 years ago.. This is soooo charming, elegant and impressive, Ade! =) Awww, I really dig the European charm and I think you are super talented and passionate! Way to go! Thanks for the giveaway! It's really elegant n has beautiful colors! Trying again. Love the design of this bracelet.. so nice and chic!! Oooh, I love the design of the necklace - and that blue colour!!! As always, you make stunning jewelries! Would love to win the bracelet for my self;)! Love this bracelet with its lovely hues of blue. Love the colour and how exquisite this European bracelet looks! Its such an awesome bracelet! Would like to win this bracelet! Lovely piece of artwork! I would love to own it. Hi Adeline! I have just come over from Diana's. I love charm bracelets as they are so gorgeous. I love the Pandora ones but they are so expensive. And you have some serious talent! Your charm bracelets can rival Pandora or any of those high end brands anytime! That blue tone theme charm bracelet is a thing of beauty. Too bad I am not in Singapore or else I would try my luck! Thanks for your kind words, Phong Hong! I'm an addict for charm bracelets. 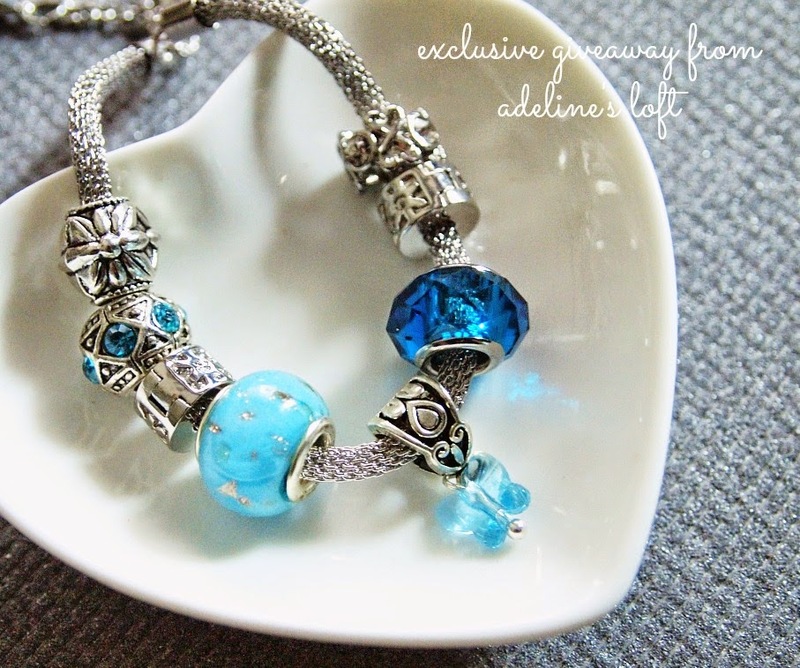 I had fallen madly in love with your blue European charm bracelet and I really hope to win this darling for myself. You are so creative and talented. Hope I can have this for my birthday which is next week. Please bless me with this!! I will take good care and wear it everyday!! So kind of you to host this giveaway! Simple yet chic and gorgeous!! !